I decided to try this technique with my lemon rice. Usually I make this dish with orzo and diced onion. Today, I am going to use plain rice and pearl onions as a side dish to my Greek lamb. 1. Put the rice in a pot with a tight lid and add 2½ cups of chicken broth. Bring the pot to a boil, reduce the heat and cover. Cook until the liquid has been absorbed, about 25 minutes. Tip: If you use a rice cooker, cover, and press the button. Return when the rice is done. No watch, no worries. 2. Just before the rice is done, about 20 minutes, melt the butter in a sauté pan. Sauté the pearl onions until they are just starting to pick up some color. Tip: Fresh pearl onions are much better than frozen, but peeling them is a pain. If you try to peel them dry you will end up removing more than the dry outer skin and have very little onion left. The trick is to blanch them for 15 seconds in boiling water and then shocking them in ice water. This loosens the dry outer skin and makes it a breeze to remove. 4. Add the ½ cup of chicken broth, the lemon juice, zest and pepper. 5. Bring the pot to a boil and then reduce the heat and simmer for five minutes. 6. Stir the rice into the sauté pan and add the salt and most of the parsley. 7. 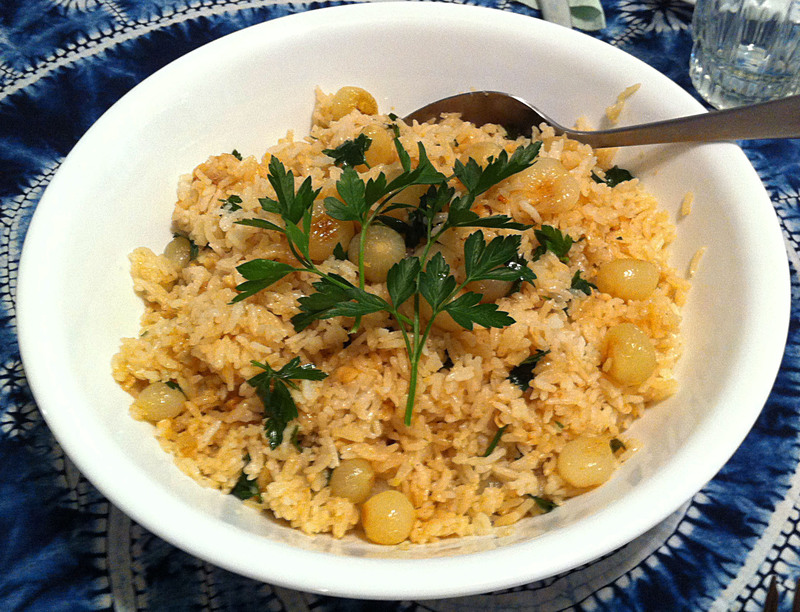 Transfer the rice to a serving bowl and garnish with the remaining parsley.